When I was in my teens and twenties, people poured into me. Skills, wisdom, manners, common sense, how to speak, how to encourage, how to listen - from Boy Scouts to church to college to my first job as an intern running summer camps in the 'hood. From working at a YMCA to fundraising to being an Admin to becoming a Consultant, people poured into me. ####I think people are the best of what rises to the surface in the Salesforce Communities. Its where business ceases to be sales and quotas and solutions stop being Process Builder and Apex code - its the folks that make your company a great place to work and knowing that we are all "works in progress"####I'm striving to continue "paying it forward" in this Salesforce ecosystem, as someone who has been invested in heavily in my life - looking to learn how to invest well in others. 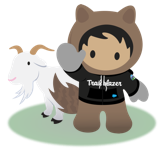 My work is mostly with nonprofits and helping them become more effective in making the world a better place through leveraging their Salesforce technology. Justin Barss hasn't posted any ideas yet.